We are actively engaged in manufacturing and supplying of Acrylic Leaflet Stand to our valuable clients. 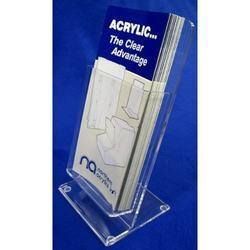 We offer different models are sizes of these Acrylic leaflet stands as per the specific requirements of our customers. We manufacture Acrylic Leaflet Stand of latest designs and features. 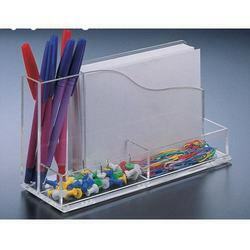 We have acrylic card holders which are made of clear acrylic material. The material used in the manufacturing of these acrylic holders is of high grade and is tested on numbers of quality parameters. We manufacture Acrylic Brochure Stand of latest designs and features. We have acrylic card holders which have wall thickness of 0.8 cm and are made of clear acrylic material. The material used in the manufacturing of these acrylic holders is of high grade and is tested on numbers of quality parameters. 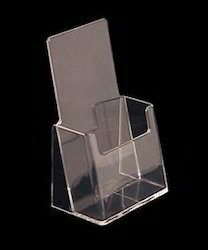 From our wide consignment, we are engaged in supplying "Acrylic Leaflet Holder"
Looking for Acrylic Leaflet Stand ?